Dubai new year eve celebrations are considered to be legendary and remain to be the prime highlight of the year to come. There are many places in Dubai where you can witness this magic. We have listed some of the top spots to catch this grand firework display in Dubai. Where to observe it ? The base of the Burj Khalifa or the Dubai Fountain gives you the best access to witness the biggest New Year’s Eve celebrations in the UAE. Several people line up minimum six hours before to catch hold of the best seat in the house. You can also make a booking at one of the waterfront restaurants in the neighborhood where you can witness the magic. But prior reservation is a necessity, as the rush intensifies as the clock moves towards 12. Also, the roads are restricted to keep tight control of the inflowing and the outgoing crowd in the area. The best part is that you can witness all this for absolutely no cost, but booking at restaurants would be charged. Cross the bridge opposite to the Dubai Mall, and you would reach Souk Al Bahar, a modern dining and lifestyle destination that houses an array of restaurants providing you a clear view of the mighty Burj Khalifa celebrations. Prior booking here is also required. In the downtown, you will find an open-air space at Burj Plaza, where you can witness the magical celebrations. Many families and visitors gather here to witness the magic of the grand fireworks. There are no charges associated for accessing any viewing spot. One of the grand fireworks that can give stiff competition to the Burj Khalifa show. The Burj Al Arab is something you can witness if you were not able to view the Burj Khalifa celebrations. 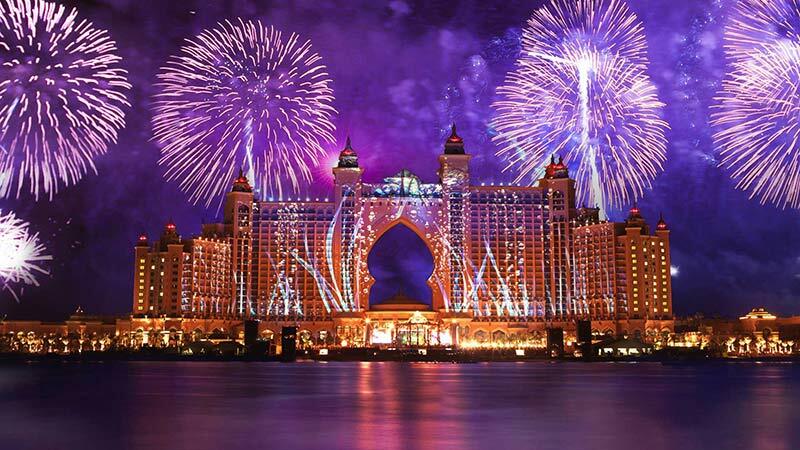 Come New Year’s Eve, the beach stretch of Dubai would be packed to see the magical experience of the grand fireworks. Carry your meal, book a picnic spot, and carry a blanket and you are all set to go. The rush here also intensifies towards the latter half of the 31st, so reaching here before sunset is recommended. There are a wide variety of shacks and cafes on Kite Beach, where you can grab a quick bite during the show. There is no fee charged to witness the grand celebrations. The Madinat Jumeirah is a modern version of the traditional souks in Dubai. Placed in the neighborhood of the Burj Al Arab and packed with an array of lounges, restaurants, and plenty of open spaces gives you unlimited options to choose from to catch the best seat in the house. The beach provides free access, but the booking of the restaurants will be charged. One of the virgin sandbars in Dubai behind the Knowledge Village gives you a captivating view of the gorgeous Burj Al Arab and its grand fireworks. One of the rare places from where you can view even the Atlantis fireworks at the same time for free. The man-made island is one of the hot spots on New Year’s Eve. All thanks to the legendary fireworks and laser show on display to its audience. Seeing the fireworks from the source is an experience in itself. Reserve a room at the Atlantis resort or book a table at the Royal Gala to catch the front seat in the house. There are an array of hotels and resorts placed on the Palm islands like Kempinski, Rixos, Anantara, Waldorf Astoria, Jumeirah Zabeel, and Saray. Each of these luxurious hotels and resorts has prime spots to witness the spectacular show. The boardwalk along the Palm Jumeirah stretches for 11 km and is one of the hot spots for witnessing the action. The crowd is immense who come over to see the magic. Do arrive early as the Palm restricts the inflow of the traffic on New Year’s Eve. The access here is free. Riverland Dubai is hosting its own fireworks show over the captivating canal and bridge to welcome the new year in grand style. If you are looking to avoid the crowds, then this is the place to be as other locations do get crowded very easily and very fast. The fireworks would be hosted at Dubai Parks and Resorts where the entry is free. You can also witness these vibrant and colorful display from the Outlet Village. The grand fireworks display intensifies over a period of one minute and is in sync with all the fireworks across the city. The Global Village hosts these fireworks with exclusive discounts on the New Year Eve packages for its visitors. The Arabian Ranches and Al Barari are some of the favorite spots to witness the celebrations. 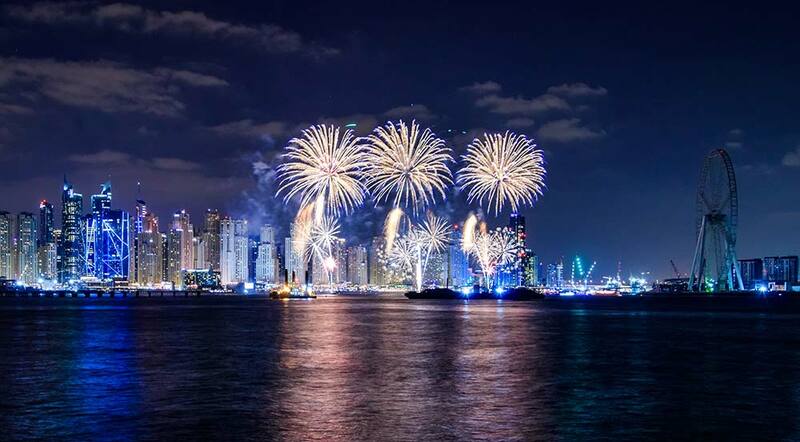 The NYE celebrations kick off in grand style at the Dubai Festival City. IMAGINE is a Guinness World Record holder attraction at the Dubai Festival City Mall that illuminates the skyline with four grand fireworks at 9 pm, 10 pm, 11 pm, and finally when the clock strikes midnight. May not be as grand as the other fireworks, but is an experience in itself. 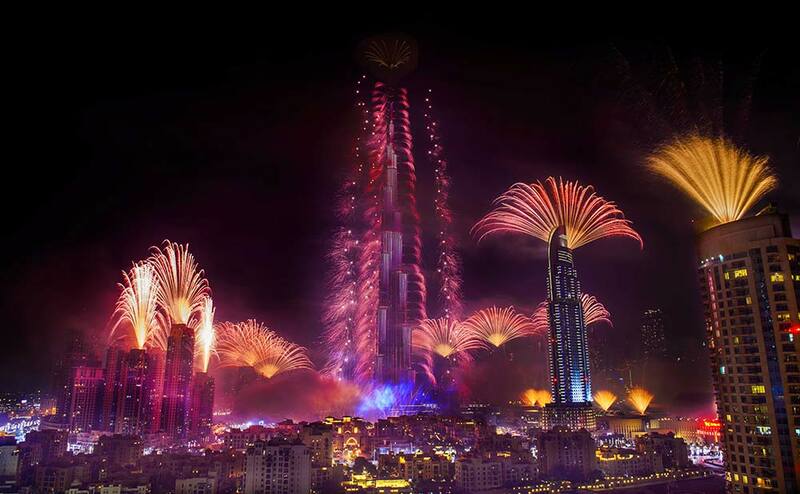 The NYE celebrations in Dubai are a symbol of the opulent and luxurious cosmopolitan nature of Dubai. These synchronized fireworks are vibrant, colorful, and expensive, but nothing is charged to the end customer for viewing this magical celebration.